This post brought to you by The Frozen Food Foundation. The content and opinions expressed below are that of This Mama Cooks. With the biggest cooking season upon us, Thanksgiving and the winter holidays, you should consider adding something to your kitchen repertoire – frozen vegetables. Not only are frozen vegetables convenient and often cheaper than their fresh counterparts, they’re as as nutritious or even more so than the fresh produce you’ll find at your grocery store. Recently a study done by The University of California, Davis in partnership with the Frozen Food Foundation showed that frozen fruits and vegetables are generally nutritionally equal to – and in some cases better than – their fresh counterparts. That’s because frozen fruits and vegetables are picked and frozen at their peak ripeness, locking in the nutrient value at the point of freezing. That’s unlike fresh produce that may be shipped half way around the world and sit in a warehouse for who knows how long – losing nutritional value along the way – before it gets to your local grocery store. Then if you’re like me, it may be another few days before you eat those strawberries or cook up that cauliflower. In the study, each fruit and vegetable was analyzed under the following conditions: frozen (analyzed within 24 hours of harvest and after 10 and 90 days of storage in a freezer) and fresh-stored (analyzed within 24 hours of harvest and after three and 10 days of storage in a refrigerator). The study analyzed vitamins B2 (riboflavin), C and E, and B-carotene (a precursor to vitamin A); the minerals calcium, magnesium, zinc, copper and iron; dietary fiber; and total phenolics (health-promoting plant compounds). To learn more, check out the Frozen Food Foundation Facebook page and the Frozen Food Foundation Twitter page. Did you know that nearly 80 percent of Americans fail to consume the recommended amounts of fruit? And nearly 90 percent failing to meet dietary recommendations for vegetables? Well, having a freezer stocked with frozen fruits and vegetables encourages you to use them in your daily cooking. I always keep big bags of frozen fruit in the freezer for smoothies and a variety of frozen vegetables for curries, stir fries, chili, soups, and skillet meals. Frozen produce is a bargain, too. Today I got a 5 pound bag of strawberries for $8.94 and a 4 pound bag of blueberries for $9.53. Fresh strawberries and blueberries were so much more expensive! I keep frozen fruit on hand so my kids can make smoothies for breakfast or for afterschool snacks. Also, I don’t have to worry about the berries going bad or finding any rotten ones, so waste is never an issue. That’s unlike buying fresh berries where I throw away dozens if I don’t eat them within a day. 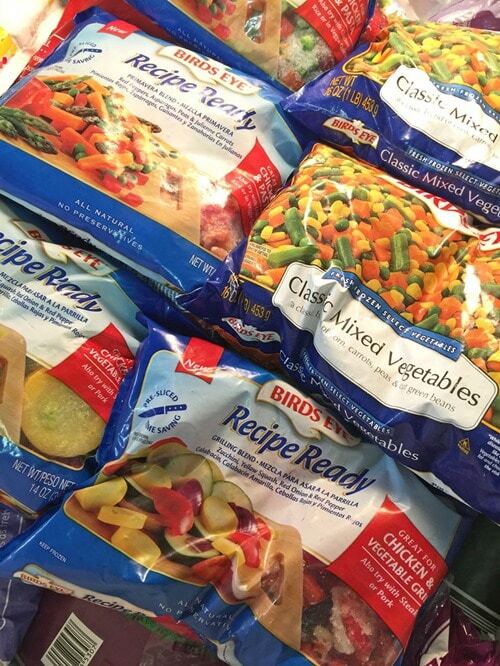 Frozen vegetables are one of your best supermarket bargains, in my opinion. Just the other day I was at my grocery store and they had 12 ounce bags of all kinds of store brand frozen vegetables, including my favorite fajita blend of onions and pepper strips, for $1 a bag. I stocked up and filled my freezer! Now I can defrost some ground beef and make tacos or burritos in about 30 minutes any night I want to! One of my biggest dinner time dilemmas is preparing an interesting side dish to go with grilled steak or pork. I came up with a dish the other night that combined two things my kids aren’t thrilled about eating – quinoa and vegetables. Yet with a few simple tricks, they ate it. Can you believe that? Rinse quinoa. Bring broth or water and bouillon to a boil over high heat. Add quinoa. Bring back to a boil. Lower heat to a low simmer. Cover and cook for 15 minutes until broth is absorbed. Let sit for 10 minutes. While quinoa is cooking, heat olive oil over medium high heat in a large skillet. 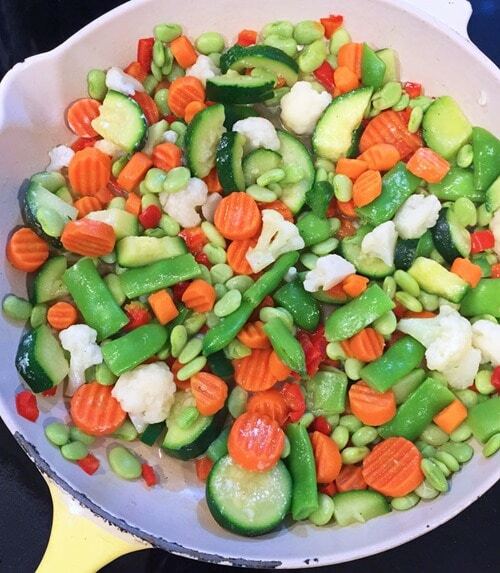 Add frozen vegetables to skillet and cook until defrosted and heated through. Keep on low heat until quinoa is done. Salt to taste. When quinoa is ready, add it to the skillet and mix to thoroughly combine. Serve while hot. How do you like to cook with frozen fruits and vegetables? What a great idea! 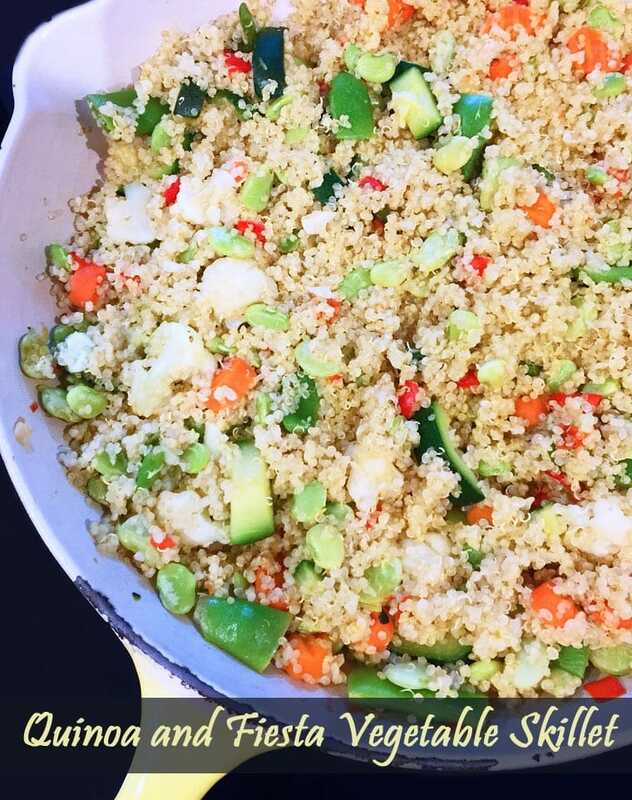 Would never have thought to combine frozen Vegies with quinoa but it makes a perfect one pot meal.